I am a Chicago-based writer currently working on The Sin-Eaters, a novel based on Japanese mythology and folklore. In 2016 I received a Creative Artists Fellowship from the National Endowment of the Arts and the Japan-U.S. Friendship Commission, which allowed me to research and write in Japan for four months. Excerpts from The Sin-Eaters received an inaugural Walter Dean Myers Grant from We Need Diverse Books in 2015 and won a Sterling Watson MFA Fellowship from Writers in Paradise in 2017. With my sister, artist Cori Lin, I am producing YONSEI: The Legacy of Japanese-American Incarceration. We frequently collaborate on projects related to our Japanese-Taiwanese-American identity. I received my MFA in creative nonfiction from the Pennsylvania State University, and my work has appeared in Passages North, [PANK], The Baltimore Review, and other publications. On the islands of the Five Crescents, seventeen-year-old Kaira is as feared as the cannibalistic oni demons or the tricky shape-shifting foxes. The birthmark on her collarbone identifies her as a Sin-Eater: a scapegoat, fated to atone for her community’s sins through annual rituals. But when her insular fishing village faces calamity– economic, environmental, political– the elders decide that her sacrifice can no longer be symbolic. The Sin-Eater, they declare, must burn. 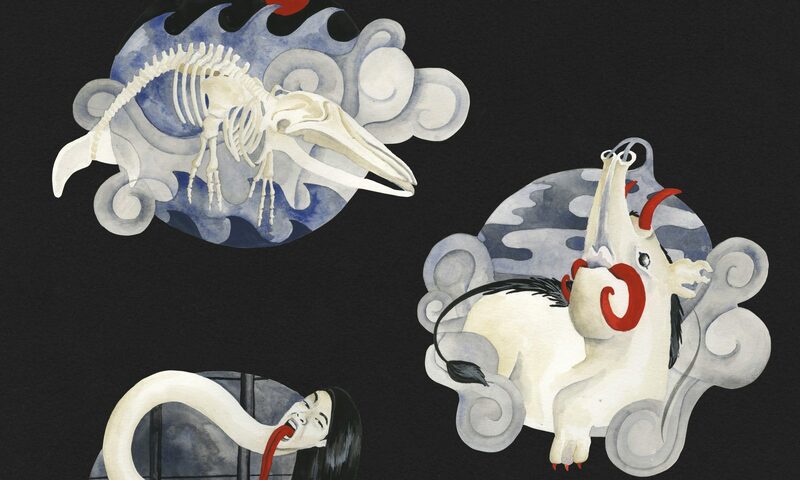 The Sin-Eaters tells her story (and the stories of the women in her family) against a mythical island landscape based on the legends and folklore of 19th century Japan. With my sister, artist Cori Lin, I’m producing YONSEI: The Legacy of Japanese-American Incarceration. It will be a 48-page full-color book– an illustrated history that catalogues the evolution of Japanese-American (JA) identity since World War II-era internment. While it is on one level a microcosm– a history of five generations of our Nakamura family amid the tight-knit JA community in Chicago– it more broadly depicts both the complicated relationship between Japanese-Americans as a people and America as a country. Through a multi-generational lens, our book looks at the lasting effects of racism and government-sanctioned trauma, and how the incarceration has shaped JA feelings towards activism and politics today. One generation’s views towards Japanese-Americans is the next’s views towards Muslims; in this way history is cyclical. We believe one way to break such cycles of fear, xenophobia, and racism is to illuminate the past. We want to show our family’s cycle as a way to make the past personal. Additionally, YONSEI aims to illustrate other aspects of JA identity and life, including faith, food, and family. We’ve already spent months interviewing various family members from my 89-year-old grandfather, who at 13 was incarcerated with his entire family in the Amache incarceration camp, to my 8-year-old cousin, who is t hree-fourths Japanese, one-fourth black, and had never heard of internment before. The book will include profiles and quotes from family members, framed by a larger narrative I’ve written that brings the themes– identity, alienation, assimilation, resistance–together. While many of my essays and stories are available in print only, a select number are available to read online.